We have 2 adventure games in our database that start with the X. If you're looking for a specific game, try using our adventure game search page. You're currently on page 1 (of 1). 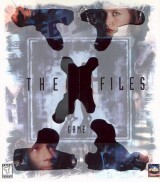 You enter the world of the X-Files as field agent Craig Willmore, assigned to assist Special Agents Fox Mulder and Dana Scully in their latest investigation into paranormal activity. All alone after crash landing your spacecraft on a desolate island, you discover ruins and statues that suggest a foreign civilization may once have inhabited the area.